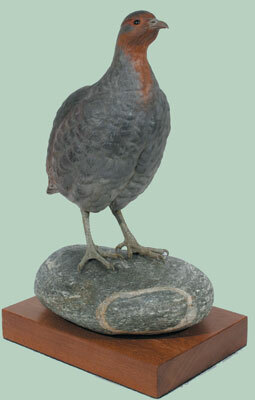 Whilst exhibiting at the CLA Game Fair, I was approached by the Game Conservancy Trust to produce several resin bronze sculptures of the native grey partridge. 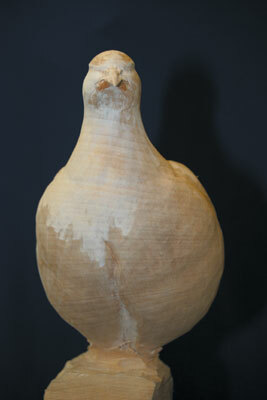 For this project, I carved the original in wood, from which I took a mould. The resin bronzes were then cast from this mould. 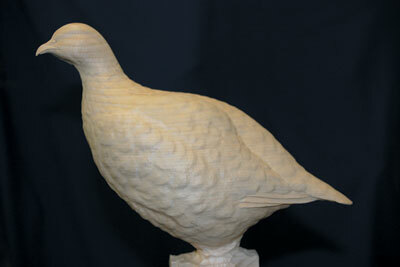 The partridge itself would be carved in lime wood. Lime takes detail well, is reasonably easy to work, is not too expensive and can be readily obtained in large enough pieces for this bird. The decision to use pre-cast metal legs (for extra strength) for each of the cast resin bronze reproductions, negated the need to carve wooden ones. As the finished original was destined to be artificially coloured, the same metal legs (see photo 1) could be used to connect the carved body to the real rock base. It is important to find plenty of reference photos, showing the subject from as many angles as possible. If you can't get your own drawings or photographs, the internet is a good source of reference material. From this collection of images, a drawing of the side profile was produced to scale. 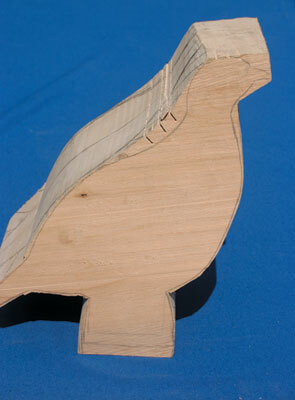 The outline of this template was penciled on to the chosen block of wood, and the basic shape of the bird was 'roughed out' using a bandsaw, followed by a 1in No.9 gouge (see photo 2). 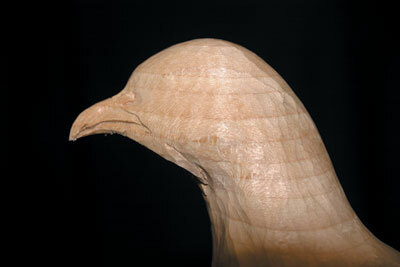 Once I had worked down to the outline as viewed from the side, the large areas of wood to either side of the head and neck (see photo 3) were removed, making sure to leave sufficient wood around the beak area to allow for the slight twist in the head. To make holding the work a little easier during the carving, an area of wood was left in the leg region, where screws could secure the piece to a carving clamp. The body was then tapered down to the tail, and the chest and back of the wings were rounded in accordance with the reference available. As birds tend to grow feathers in distinct groupings, I generally choose to carve these major groups onto a bird before tackling the individual feathers. Once these groups were marked in, a 1/4in No.11 gouge was used to go over the pencil lines. Where there was one group overlaid by the feather group above it, the upper edge was reduced so that it appears to emerge from beneath that upper grouping. 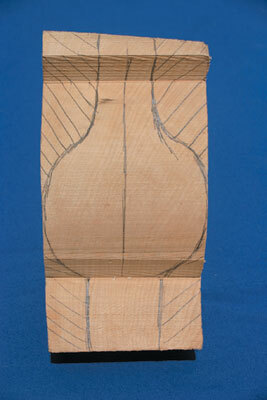 All edges of the gouge lines were rounded off with a flat chisel (see photos 4-6). 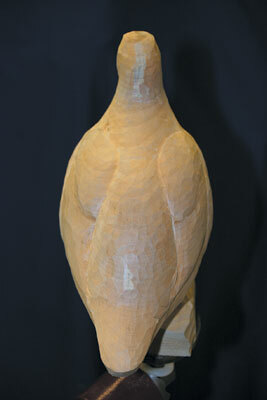 A light sand over with 180grit abrasive paper left a nice, clean surface to draw in the individual feathers. The reference material enabled me to copy - as far as I was able - the different feather shapes and the directions they lay in. 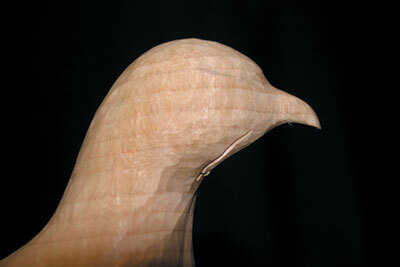 The outline of each feather could then be carved, using various sized gouges. 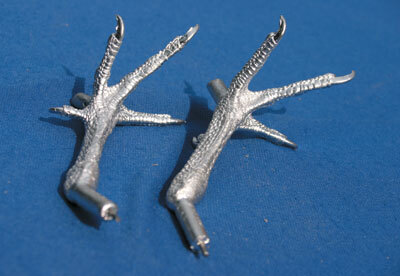 These ranged from a 1/4in No.9 for the larger feathers, and working down to a 1/8in No.9 for the smaller ones. As with the feather groups, the top edge of each feather was angled so that it would appear to emerge from beneath the feather above it. 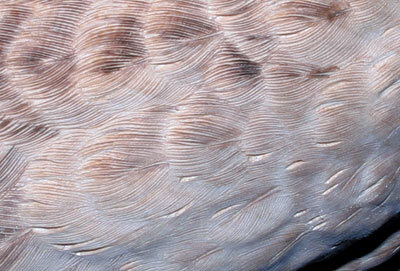 For the soft and downy feathers on the chest, the major undulations were carved in and sanded prior to marking the individual feathers, which lie like random, variously sized slates on a roof. Care was taken to avoid too much uniformity, as this can look unnatural (see photos 7-11). Before going any further with the feathers, I decided to get the head sorted, along with fitting the glass eyes that had been obtained from a taxidermy supplier. 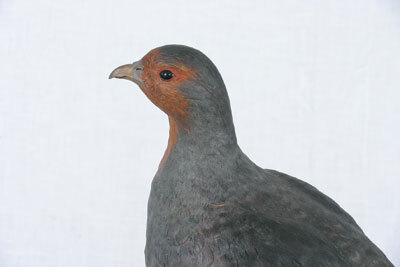 First of all, the head shape, beak, and nostrils were refined. The dividing line between upper and lower mandibles of the beak was then penciled in, paying close attention to keeping the symmetry between left and right sides (see photos 12-13). The lower mandible was then reduced in width by running a V-tool along the middle of this pencil line, then paring down the sides with a scalpel. The centre point for the eye position was then marked (see photo 14). One area that concerns a lot of carvers is how to make sure the eyes remain relatively even; though few things in nature are perfectly symmetrical, uneven eyes tend to look daft. A nice simple method that works for me and can be adapted to suit most situations, is outlined below. Carefully mark the position of one eye with a pencil, taking measurements or cues from reference material. Place the point of a mathematical compass on the centre of the top of the head, and open the compass until the pencil reaches the centre of the eye shape that you have already drawn. Keeping the point of the compass in the same place, and the compass open at the same width, move the pencil to the other side of the head and draw an arc. Then repeat the process with the compass point on the tip of the beak - or nose if you're not carving a bird - and draw an arc that will cross the line previously marked. The point where the two arcs cross is the centre of the second eye. As this bird was destined to be stained with inks, glass eyes could be used rather than my normal method of carving integral eyes. 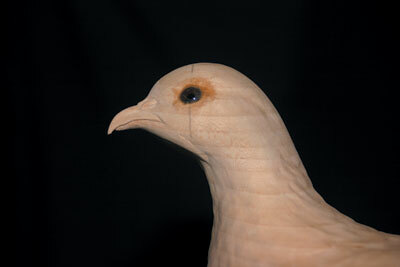 Using stains also means that eyelids could be fabricated from sawdust and PVA glue, as they will be stained to match the rest of the bird - which in turn means a bigger than usual eyehole could be carved, thus enabling easier fitting of the glass eye. Carefully carve out a hole for the eyes using a small, 4mm (5/32in) burr in a mini drill, leaving as small a gap around the edge as possible (see photo 15). 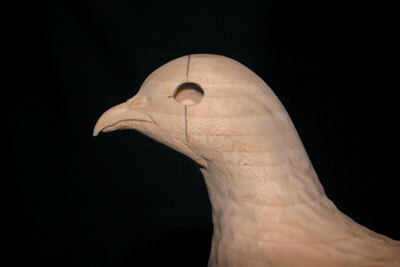 Carve the inside of the eyelid area to fit the curvature of the glass eye. 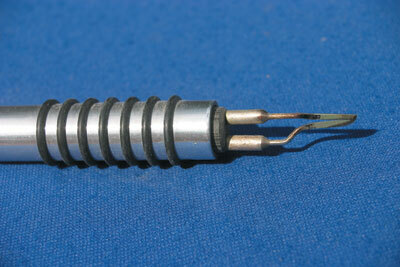 While you have the mini drill out, hollow out the inside of the nostrils using a smaller, 2mm (5/64in) diamond burr. 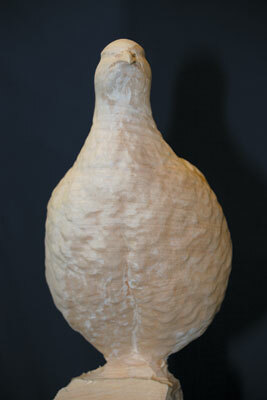 Make up a mixture of PVA glue and sawdust with the same wood from which you are carving. 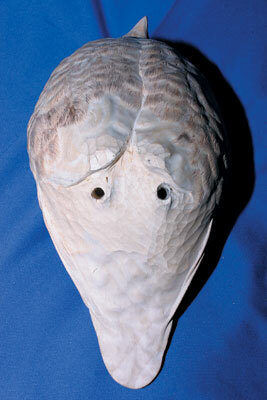 Fit the eyes into the sockets with this mixture behind them, allowing some to be squidged out of the sides. Allow 24 hours for the sawdust and PVA material to harden, and then carve in the eyelids using a small V-tool (see photo 16). When sanding the head area, take care not to scratch the glass eyes! 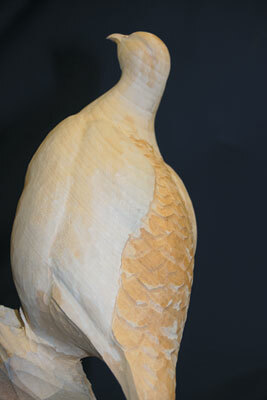 As the partridge is to have quite finely detailed feathers, I decided to make use of a pyrograph. 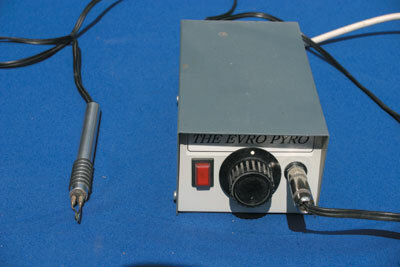 A pyrograph (see photos 17-18) is an electrically heated scalpel blade that is used like a pen. By using a heated blade, the water in each cut is vapourised, which ensures the cut stays open. If a normal blade were used, the cut would close if painted or oiled. When carving the feathers, the central shaft - or rachis - was marked in, then the finer barbs were added with the odd random split for a more natural look (see photos 19-20). 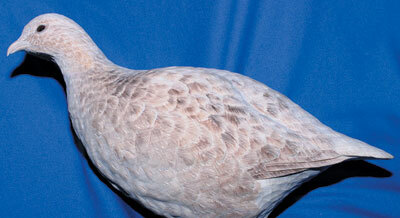 Care had to be taken when tackling the small feathers around the head area (see photo 21). 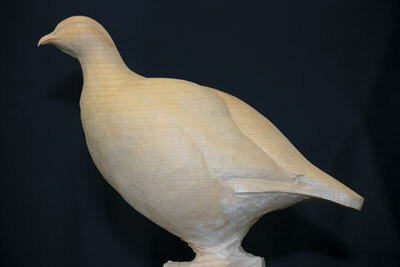 At this point, I had done as much as I could while the bird was attached to the carving clamp. 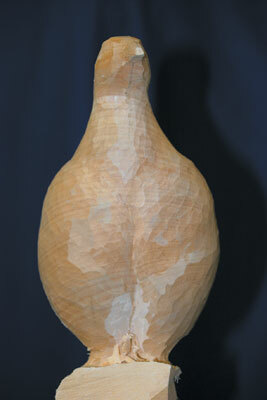 After sawing off the securing block, the underside of the bird was shaped, the holes were drilled to accept the metal legs, and the last few feathers were carved and detailed (see photo 22). 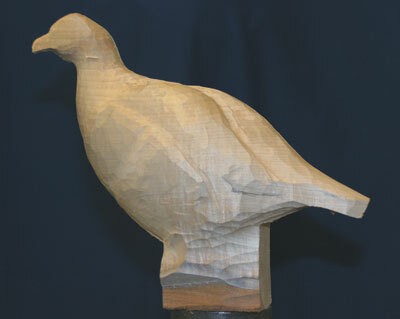 The complete carving was finished by staining with Windsor and Newton inks. These inks are easily mixed to obtain an approximation of the correct colours. 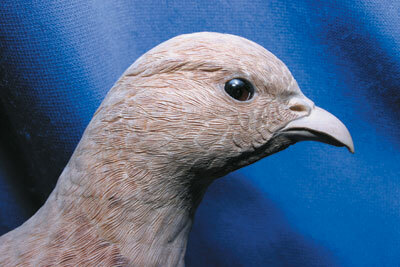 Using the reference material as a guide, the feather colouring was applied with a fine brush. When the ink had dried after a couple of hours, a liberal coat of Liberon finishing oil was brushed on and allowed to dry overnight. Finally a coat of wax was applied to give a subtle sheen and added protection. This was applied sparingly with a brush, and then after 30 minutes, it was buffed with a rotary brush fitted into a hand drill. The sculpture was completed by painting the metal legs, and then fixing these with araldite into the receiving holes in both the partridge and its rock base. "Lime takes detail well, is reasonably easy to work, is not too expensive"
Bill Prickett is based in Kent. He teaches on a private basis. For details of courses ring: 08707 406161.